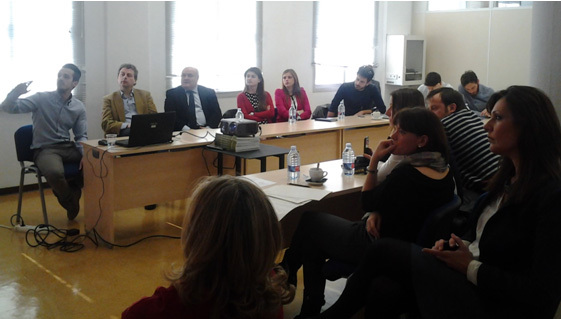 The hosting partner, INDICO, organized a roundtable with invited local institutions and stakeholders, with the main topic being: ”promote local development by fostering co-operation between training institutions, enterprises and labour market local operators”. The event took place in the Fundación Ebropolis venue in Zaragoza. The Association for the Strategic Development of Zaragoza and its Metropolitan Area, better known as EBROPOLIS, began in May 1994 with the purpose of elaborating and promoting the Strategic Plan of the capital and its Metropolitan Area. It has been declared of public utility. EBROPOLIS is working to be a meeting point for all people and entities committed to the future of Zaragozans. And it is doing this guided by the basic principles which have characterized the actions of the Association from its beginnings: broad participation, consensus and public-private cooperation. The conference was opened by Beatrice Bellet, as the hosting partner representative, who introduced the main speakers being Laura Fuertes representing the Ebropolis Foundation. 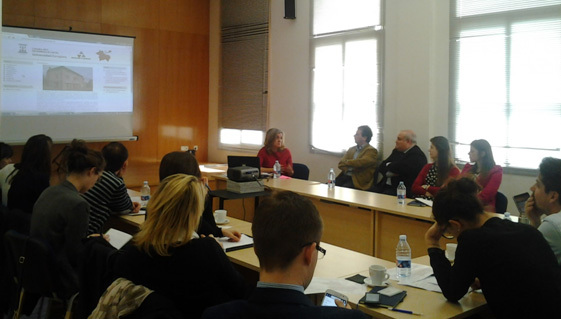 Laura Fuertes presented the main activities implemented by EBROPOLIS during its 20 years of activity to participants. This Foundation has developed the local strategic development plan of Zaragoza and includes a network of 80 local companies. Mr Francesco Da Re presented in short the main goals and activities of the EXPLORE project and presented their Italian Case Study called “Antenna Sviluppo”. This case study dealt with the ways of supporting employment and community-led local development in Veneto Region. Bartosz Kruszewski presented the Polish Case Study called “Curriculum vitae as the first step to change the course of life”. Tommaso Marazia presented also the Case Study which dealt with the crisis of ILVA S.p.A. regarding the environmental and economic devastation of the Province of Taranto – Puglia (Italy) – and its legal, social and economic aspects. Carmen Pelet, lecturer of University of Zaragoza, presented the Cathedra called Local Development between the University of Zaragoza and Provincial Delegation of Zaragoza. The objectives of this cathedra is to increase the participation of managers of local government entities (Provincial Delegation of Zaragoza and municipalities in the province) in the University, to share lessons learned; organize continuous training; conducting student placements; promote, design and organize communication and training actions (conferences, seminars, courses …). The Cathedra aims to study and publicize the problems and the socioeconomic characteristics of rural areas in the province of Zaragoza, to enhance their development and encourage the improvement of their quality of life through various outreach activities, training, analysis and participation that bring the rural university, and vice versa. Beatrice Bellet from INDICO presented the Competyo Project and other sectorial Alliances where INDICO is working actively. A local initiative to promote Innovation & Competitiveness of companies through knowledge and the improvement of people and where private and public entities collaborate together for local development. There were approximately 25 attendees to the seminar, some of them have exchanged the contact details with the speakers, willing to build and maintain their relationships with project partners and hoping to exchange further experiences and opinions in the future.